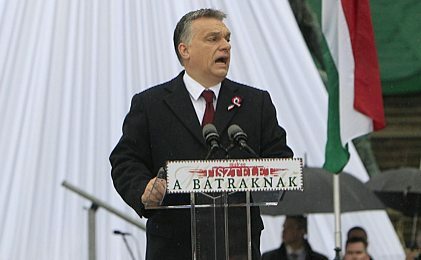 In this historic speech, the Prime Minister of Hungary cries for Europe to unite and fight the political correctness that is destroying the freedom of Western nations. March 15 – 2016. Here the Truth, according to Victor Orban – Hungary PM – about the future of Europe ….and West. The transcript of his speech is just below the video. I saw this earlier today and had it lined up to send on facebook and emails etc.. but was cautious because these are days of people knowing your business, of you just don’t know who and what thinking what, of slanted reports on this particular issue that tends to demonize viewpoints like Mr. Orban’s. I have to agree with PM Orban. When a peoples way of life is threatened by outside forces then it’s time to shut the door. Muslims cannot expect to migrate/immigrate or by any other term used these days, to other countries and impose their way of life on their hosts. At the same time we cannot blame this particular group for what’s happening in Europe because as Mr. Orban has stated, it’s all about “Political Correctness” and, in my opinion, to a larger degree, votes, money and power. It’s probably too late now for Europe to take back control of their countries. Let’s see how many will follow the lead of Mr. Orban. In Canada,it would seem that the present PM is using the “refugees” for vote stacking.Removing legislation thus permitting immediate citizenship, with full benefits, not offered to seniors,but not as scary as the strategic placement in provinces and locations seemingly to ensure a LIBERAL majority. Stay tuned. If Trump could communicate half as good as the Hungarian PM he would be US President in Nov. We do not have the degree of problem as Europe because once you have an American accent you are accepted as American…..integration or assimilation is much easier. That does not mean it would be easy to find a job in the US with a Muslim name. . The chaos in the Middle East as a result of the West’s so-called War on Terror now threatens the stability of the European Union. Is this a deliberate plan of the “faceless world powers” or an unexpected development? Orban believes that the disintegration of Europe is their ultimate goal. The chaos in the Middle East as a result of the West’s so-called War on Terror now threatens the stability of the European Union. Is this a deliberate plan of the “faceless world powers” or an unexpected development? Hungarian Prime Minister Victor Orban believes that the disintegration of Europe is their ultimate goal.